Opening in 2012, Disney’s Art of Animation Resort is the newest resort at Walt Disney World. It features 4 different highly themed sections including Finding Nemo, The Lion King, Cars, and The Little Mermaid. 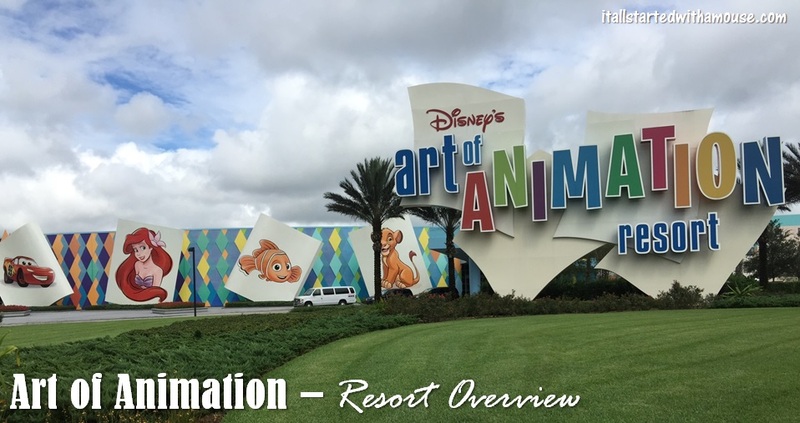 There are a few different room types available at the Art of Animation Resort. Finding Nemo, The Lion King, and Cars are all family suites that sleeps up to 6 people. The Little Mermaid rooms are standard rooms which sleep 4. If you are staying at the Art of Animation (or even if you’re not), be sure to take some time to check out the different themed areas of the resort. At Art of Animation you will get a chance to visit Radiator Springs, go under the sea to meet the Little Mermaid, visit the pride lands, or ride the EAC! For the shopper in your family, be sure to check out the Ink and Paint Shop, located within Animation Hall, for great souvenirs. There are 3 incredibly themed pools at Art of Animation. The largest is The Big Blue Pool, which is located in the Finding Nemo courtyard. There is a kid’s splash area located here called The Schoolyard Sprayground, and in the main pool, you can hear music under the water! There are 2 quiet pools, one located in the Little Mermaid courtyard called Flippin’ Fins Pool. The other is the Cozy Cone Pool, which is located in the Cars courtyard. Grabbing a meal at Art of Animation? Check out the Landscape of Flavors food court, located within Animation Hall. They are open for breakfast, lunch, and dinner, and feature different areas where you can grab different cuisine. There is a Mongolian grill, a build-your-own burger station, pizza and pasta, and a quick-grab section. Check out the full menu here. Little Mermaid standard rooms have either 2 double beds or 1 king bed. Family suites have a queen bed in the bedroom, as well as a sleeper sofa double bed and a “TableBed” – a dining table that folds down into a double bed. Family suites also have 2 full bathrooms. Cribs are available upon request. Rooms come equipped with a safe, TV, mini-fridge, iron and ironing board, hairdryer, and free wi-fi. Laundry facilities are located near each pool. It is important to note that Little Mermaid standard rooms are usually left out of any discounts that Disney offers, whether it’s room-only discounts or free dining. Additionally, the Finding Nemo suites were recently upgrade to “preferred rooms” so they cost a bit more than the Cars and Lion King suites.